Nike's marketing pitch: Lofty comfort. Striking speed. 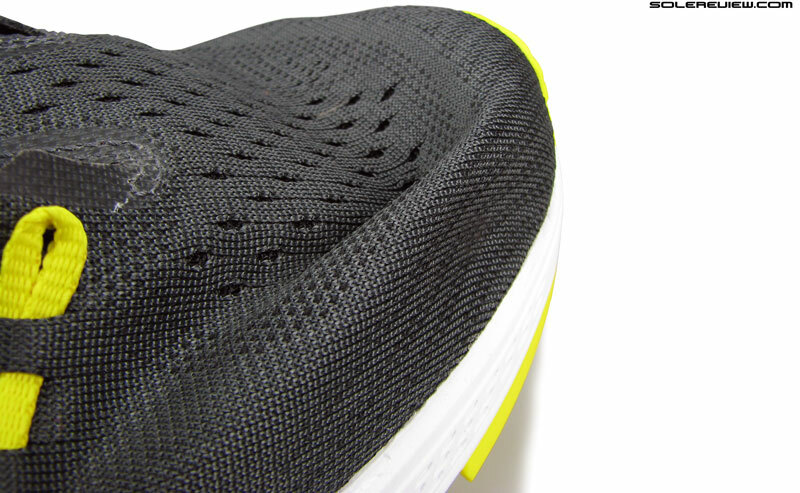 Surfaces tested on: Road, ambient temperature of 27° C/81° F.
Upper: Engineered mesh, inner sleeve, flat lacing cords. 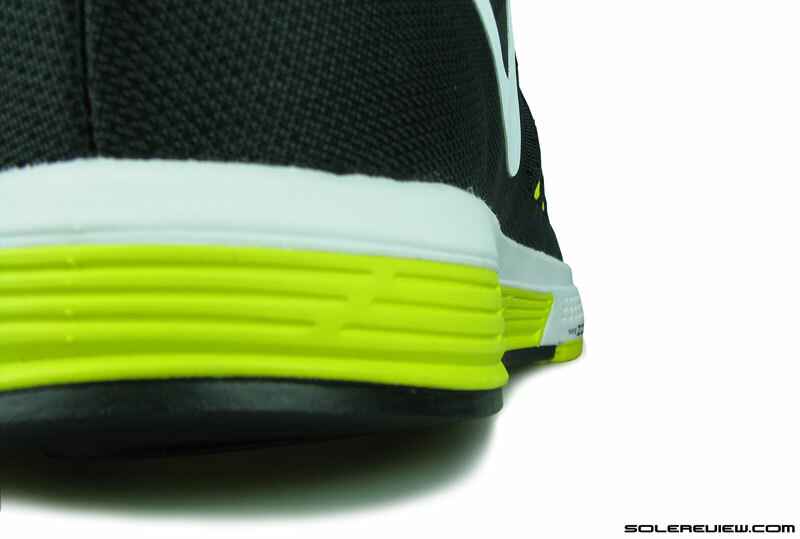 Midsole: Front and rear Zoom Air bags, Lunarlon and compression molded EVA foam. 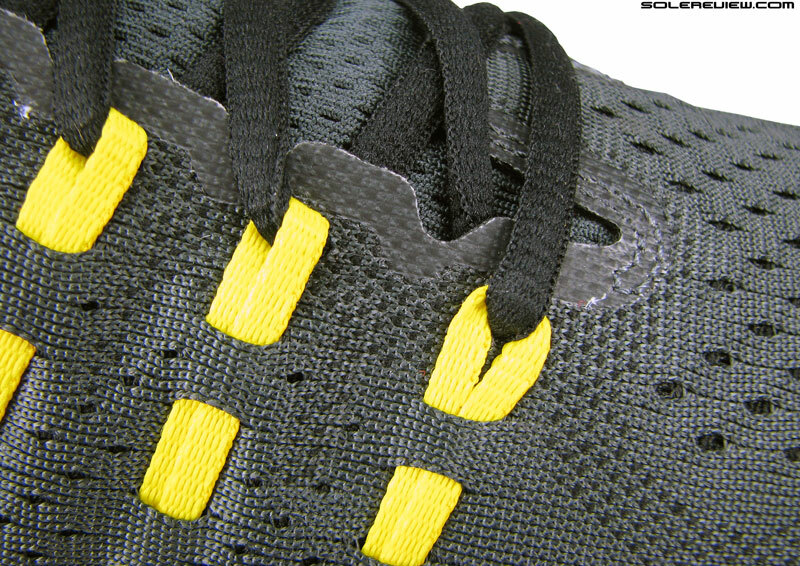 Outsole: Harder carbon rubber under heel, softer blown rubber under forefoot. Widths available: B-narrow, D - regular (reviewed), 2E-Wide, 4E- Extra wide. The midsole design of the Vomero 11 hasn't changed since the Vomero 10, but the ride turns much softer because of a few updates. The upper fit will come as a surprise; the generously padded heel and tongue results in the shoe fitting smaller and snugger than the 10. About time the Vomero got its mojo back. If there’s a recurring theme in our past Vomero (v6~v9) reviews, it’s been about the lack of the plush ride which made the first few models so popular. If you’ve run in the Vomero versions 1-5, then you know exactly what we mean. The abrupt change began in the Vomero 7, and things crawled slowly till the 9th version – because the midsole design stayed constant for three years. The uppers weren’t great either; they had the look and feel of other Nike models which could be had for a much lower price. The Vomero 10 gave the long continuing franchise a shot in the arm. The Vomero 10 remedied a lot of what was wrong with Nike’s premium cushioning offering all these years. A brand new midsole and outsole architecture helped make amends, and so did a reworked upper. There were a couple of areas which needed improvement, however. The sparsely padded heel was loose fitting, and did not inspire confidence. 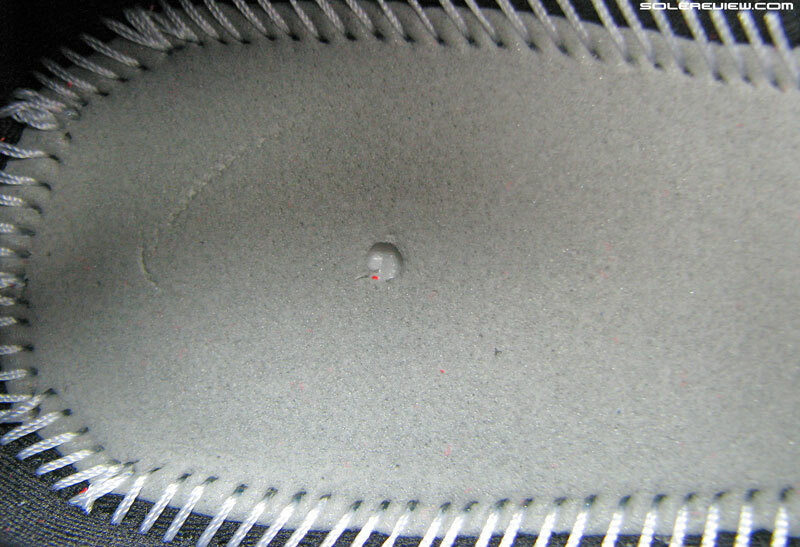 The foam deprivation also applied to the Vomero 10’s tongue, which did a poor job at insulating the lacing pressure. When cinched tight, the Vomero 10’s laces could be felt stretched tight over the foot, a sensation which isn’t exactly an embodiment of plushness. The Vomero 10’s upper was comfortable owing to the use of an inner sleeve and a single piece covering. And notwithstanding the lack of foam quilting, the collar lining had a soft hand feel. The new Vomero 11 literally builds on the outgoing Vomero 10, filling in the gaps with added material. The tongue goes from flat to plush, trading its calorie-restricted diet for a fulsome meal of foam padding. Compare both the versions, and one doesn’t need a Vernier Caliper to tell you how much plumper the Vomero 11’s tongue is. We’ve got a picture comparing both later in this review. 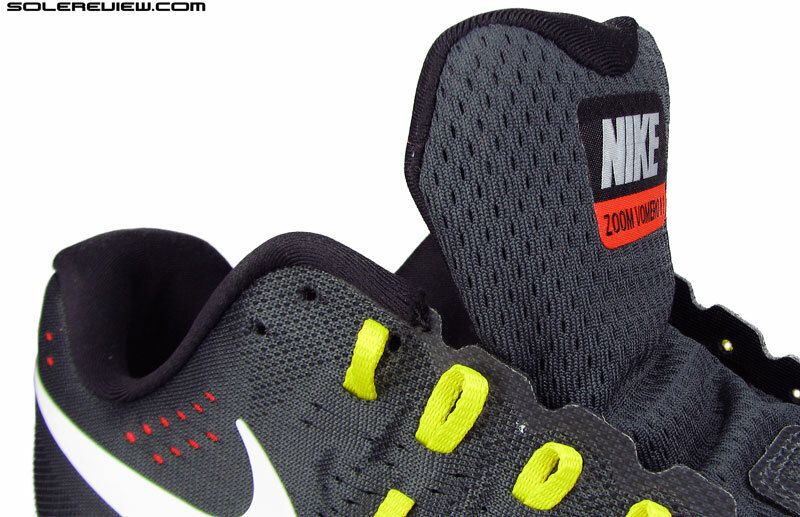 Nike gives the upper heel a similar treatment, increasing the foam volume packed within the collar walls. 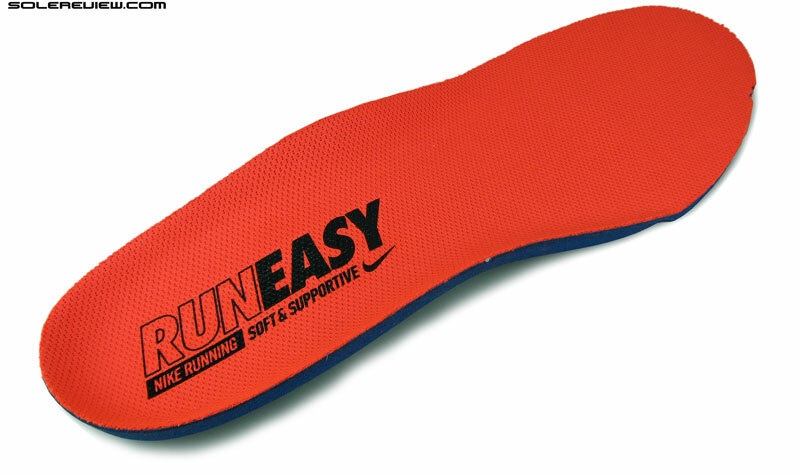 The enthusiastic infusion of foam (especially in the heel) has an undesirable side-effect on the upper fit, however. There are a few other updates, such as the design change in the ‘Flywire’ cables, which influences the upper fit of the Vomero 11. The Vomero 11 looks similar to the 10 for the most part. The dual density midsole hasn’t changed from a construction perspective. At first glance, the Vomero 11 sports an underpinning identical to the 10. The midsole retains the Vomero 10 design, interlocking two densities of foam. 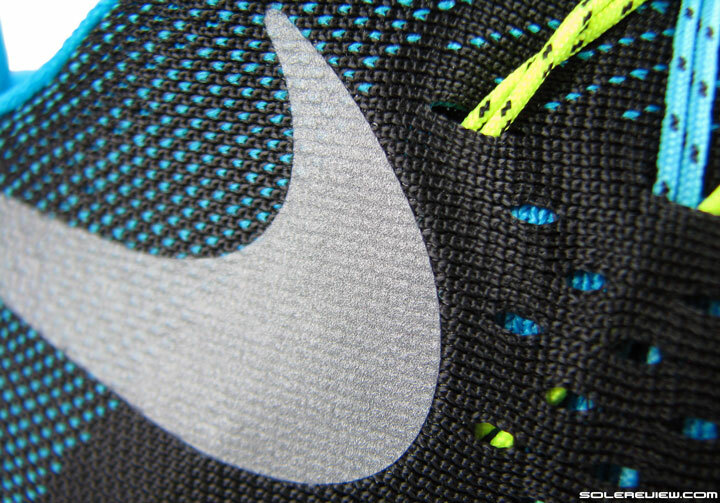 As per Nike’s product description, the midsole is a blend of Lunarlon and EVA. 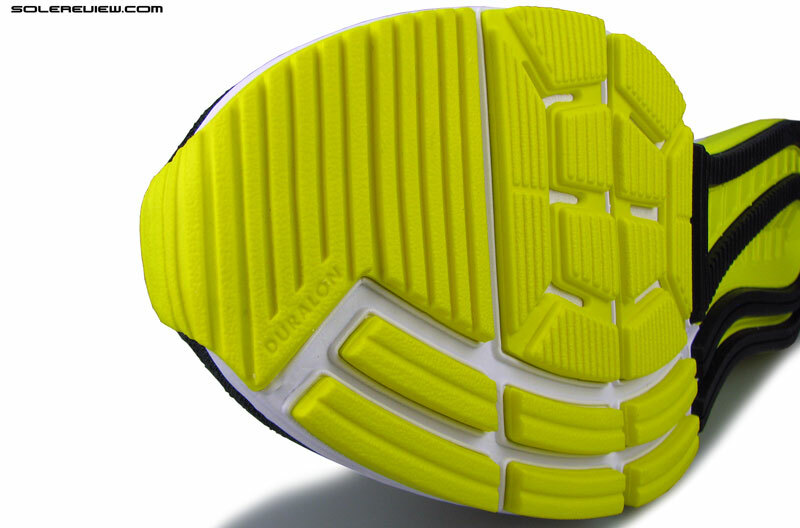 The larger white piece is supposed to be Lunarlon, and the yellow foam under the heel is EVA. The outsole geometry hasn’t changed either. The forefoot is padded with soft blown rubber (Duralon in Nike speak), and the mid to rearfoot is covered with a harder rubber compound. They say that you shouldn’t judge a book by its cover, and that holds true for running shoes too. 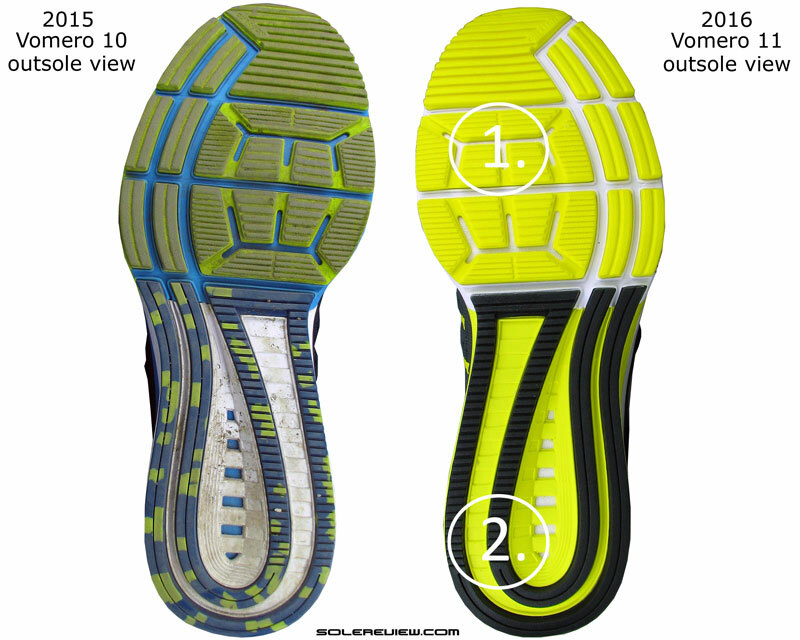 Regardless of the Vomero 11’s midsole being a dead ringer for V-10’s midsole, its ride behavior is markedly altered. It runs much softer than the Vomero 10. The V-10’s forefoot was softer than the heel to begin with, and that cushioning distribution strategy stays constant in the 11. Only that the Vomero 11’s forefoot is way softer than the 10, and the heel is halfway there. The Vomero 11 has a dual stacked midsole design, and the layer on the top – the white colored one – has gone much softer. The difference is instantly noticeable. Compared to the relatively firm Vomero 10 forefoot, the V-11’s foam has a lot of give. But there are a couple of things which prevents the shoe from turning downright mushy like the Nimbus 17. The forefoot foam is easier to compress on the Vomero 11, and the firm Zoom Air bag keeps it in check. The foam is responsive; there’s a certain amount of eagerness to bounce back. Of course, we’re comparing this to regular soft EVA and not superior materials such as the adidas Boost. But then, the Vomero 11’s forefoot foam has company in the form of a large Zoom Air bag filled with compressed gas. The Zoom Air bag prevents the foam from bottoming out, and the soft foam allows the Zoom Air bag to be more accessible. Ever since the original Vomero debuted a decade ago, Nike has used a soft blown rubber compound to pad the forefoot outsole. 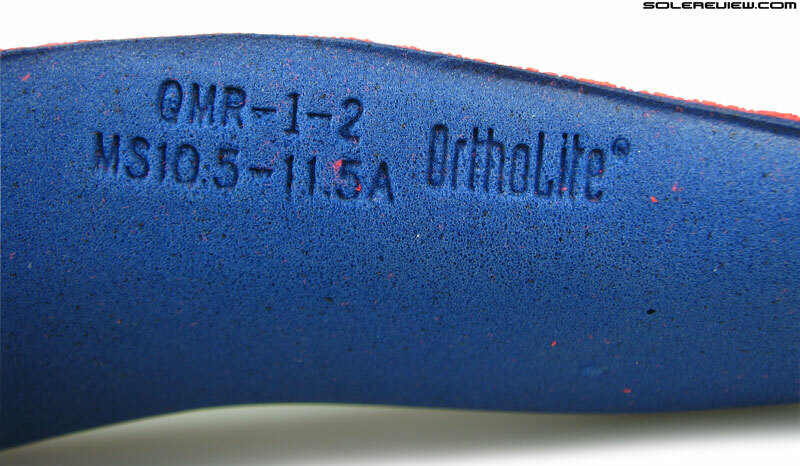 Brands using blown forefoot rubber is a fairly common approach, with only variables being the layout and foam densities. 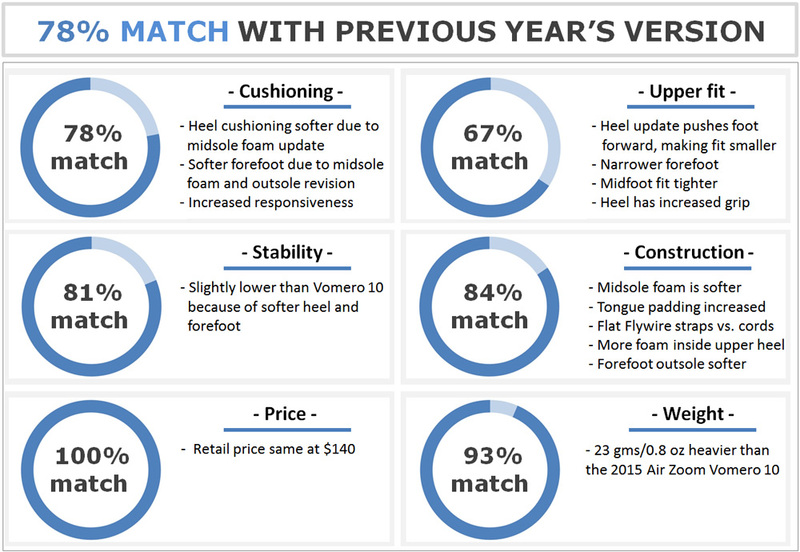 In Vomero 10’s case, the forefoot outsole was comparatively much firmer than the 11’s. The 11 has the same outsole design as the 10, except that the blown rubber forefoot changes in density. As if taking a cue from the softened midsole foam, the blown rubber under the forefoot transforms into a softer version of itself. It is at least 30% softer than last year, if not more. The design is exactly the same, however. The forefoot is made of 9 different rubber pieces, forming flex and transition grooves. Owing to the increased softness, the Vomero 11 ends up being more flexible than the V-10. Hard cellulose board over the Zoom Air bag no more. 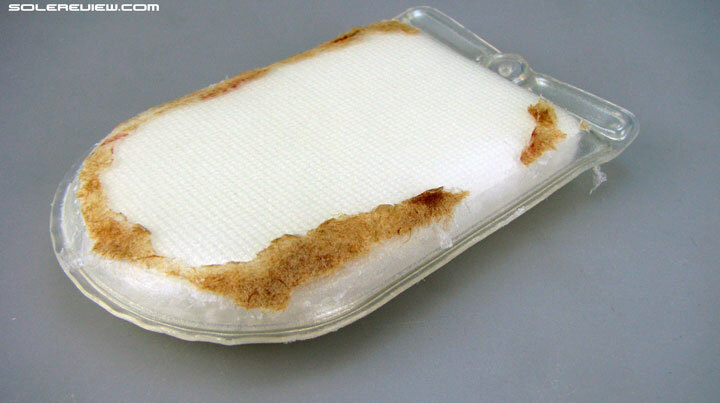 Instead, there’s a thick fabric based substrate. That’s the material seen under the lasting alignment hole. In the rear, the heel is a softer version of its former self. 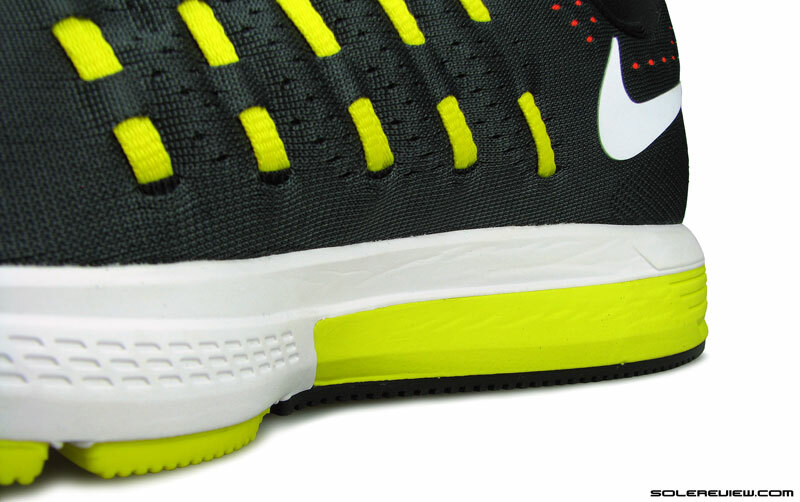 There’s the upper Lunarlon layer (now cushier) which makes it so, and there’s another thing worthy of note. The last few Vomeros (7 onward?) had a hard cellulose board over the heel Zoom Air bag. That material made the heel cushioned yet firm. The Vomero 11 ditches the board for a fabric based substrate. 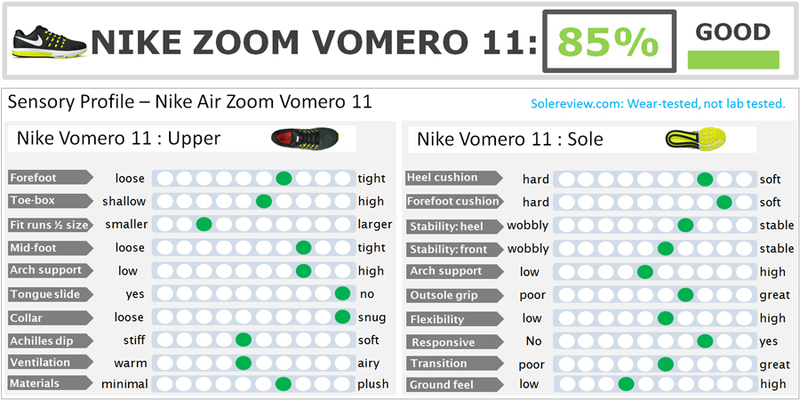 Identical insole design to that of the Vomero 10. Like the midsole and outsole, the insole also goes squishier. Ortholite is a commonly used insole supplier within the athletic footwear industry. While we can’t tell what exact kind of textile that is without slicing the shoe open, it appears more pliable than the hard board. Logically, this update should also add to the softer ride experience of the Vomero 11. 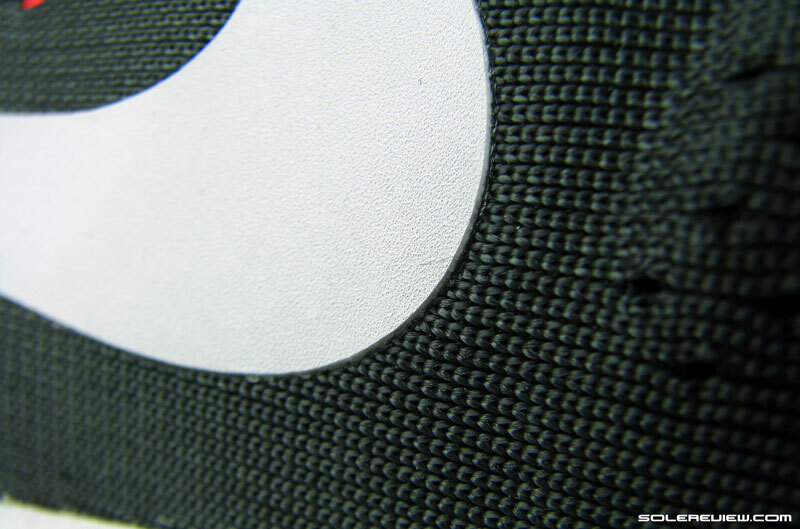 And finally, topping the midsole components is a padded, Ortholite branded insole. 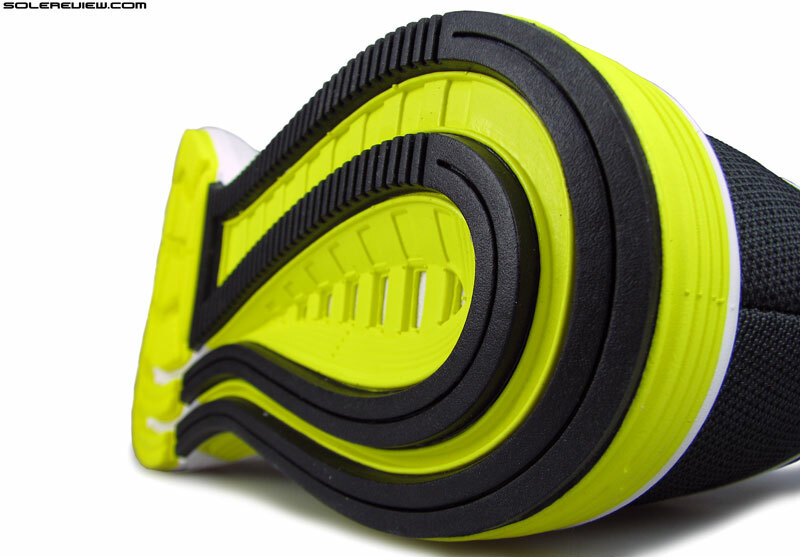 The design and thickness is the same as that of the Vomero 10, except that the foam is slightly softer. 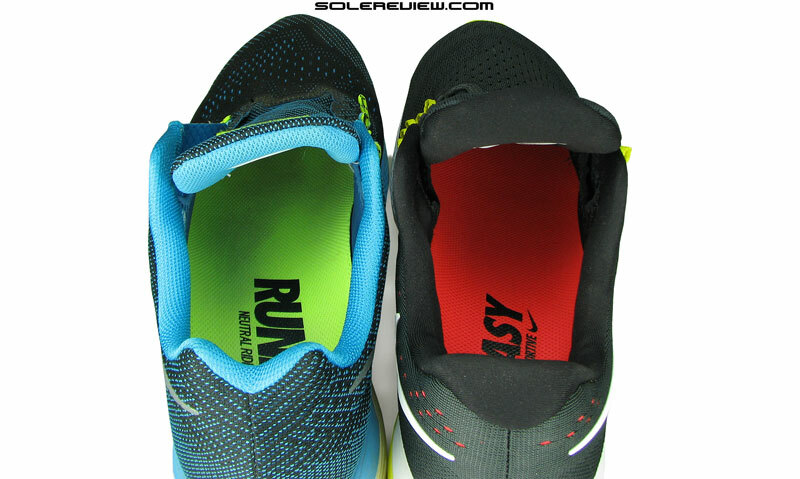 1) Identical outsole design and layout, but the front has more squish 2) The same happens to the heel too. Why? Nike has updated the midsole foam and forefoot rubber densities. The net result is a much softer Vomero, perhaps the softest Vomero since the 5th version. The dramatic level-up in ride softness can turn out to be an element of surprise, especially if you’re moving up from a Vomero 10. The Vomero 11 happens to be one of the many within the assortment of premium neutral cushioning shoes. You have the Asics Nimbus 18, which is medium-soft from a ride perspective while lacking responsiveness. The Brooks Glycerin 13 is a cushioned and supportive workhorse, though half the shoe which the Glycerin 10 was. The New Balance 1080 V6 pulls the original Fresh Foam trick, masking its firm riding midsole with a plush insole. Saucony plays the Everun card, infusing its pinnacle neutral trainer with the adidas Boost like foam. So on this wide (and diverse) spectrum of similarly positioned shoes, where does the Vomero 11 lie? If it weren’t for the dual Zoom Air bags and the supportive EVA foam frame (in yellow) below the midfoot and heel, the Vomero 11 would have been softer than the uber-oft Nimbus 17. But the Vomero 11 does have these components, and that makes the whole difference. 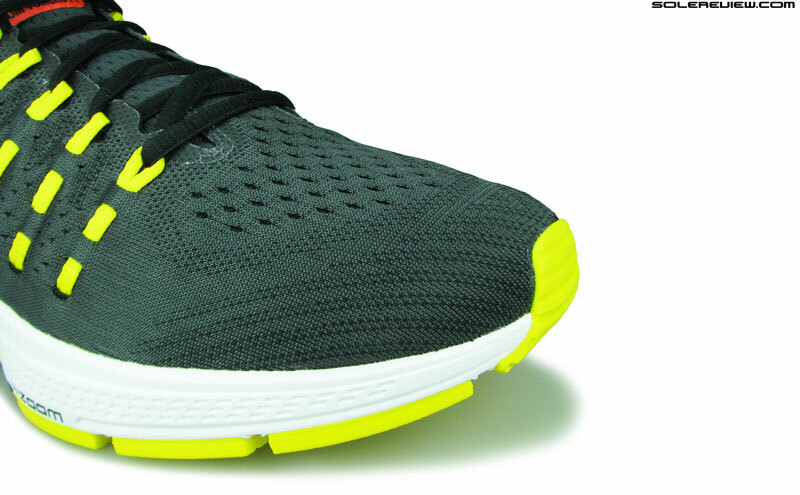 The Vomero 11’s ride is a balanced mix of soft cushioning and responsive spring-back behavior. 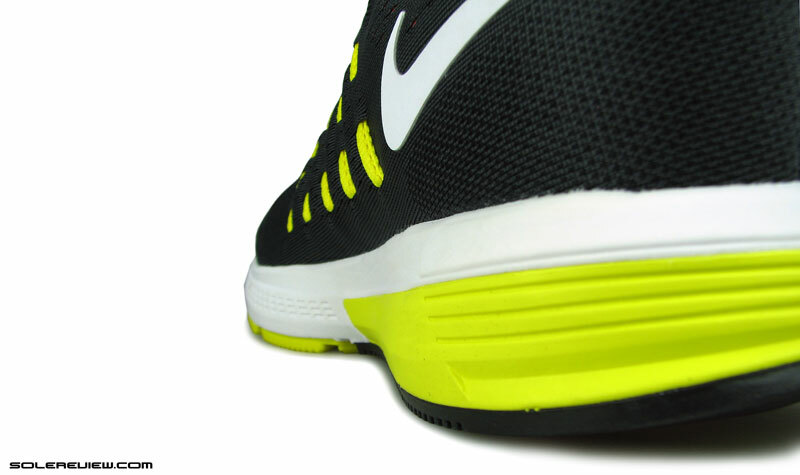 The soft Lunarlon makes the ride, uh, soft, and the firmer Zoom Air bags respond on demand. 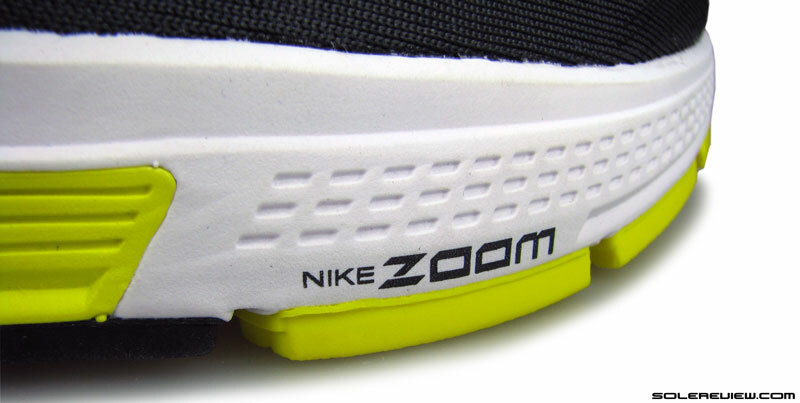 A soft foam midsole also helps tap into the Zoom Air bag’s properties better. With softer surroundings, the Zoom Air bags play a larger role in cushioning duties – the soft Lunarlon compresses faster under weight (relative to the Vomero 10), leaving rest of the cushioning burden to Zoom Air. The white foam might be softer and bouncier than before, but the firmer (yellow/lime color) casing stays put. The firm EVA (yellow) base and Zoom Air bags keep the otherwise soft Vomero 11 supportive. The bags also help stabilize the shoe to a large extent. The bags are rather sizable – we’ve seen it on numerous occasions – and that acts as a support element too. 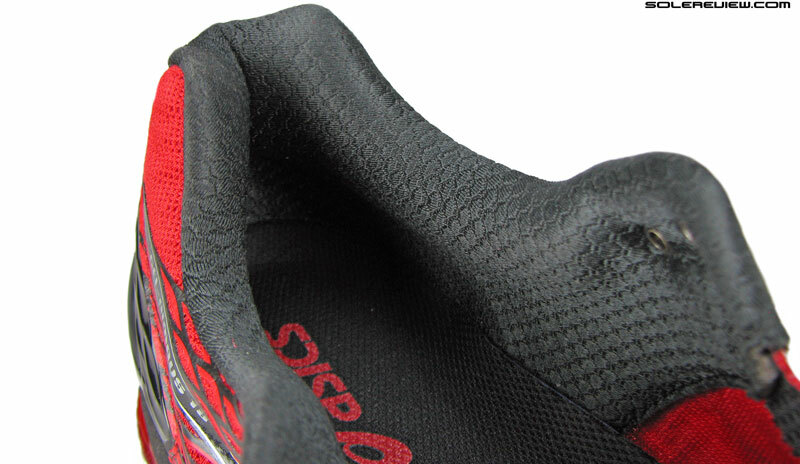 The firmer EVA cupping under the heel and midfoot also prevents the soft foam from creating excessive bias. Though the Vomero 11 still manages to be a supportive shoe due to the presence of Zoom Air bags and the firmer EVA base, the V-10 felt decidedly more planted. In a nutshell, the Vomero 11 is a superlative mix of soft cushioning and responsiveness, the kind of ride quality desirable for longer runs. This is a reversal of sorts within the Nike playbook; the Pegasus went from soft (V30) to firm (31), and the Vomero 10 did too. 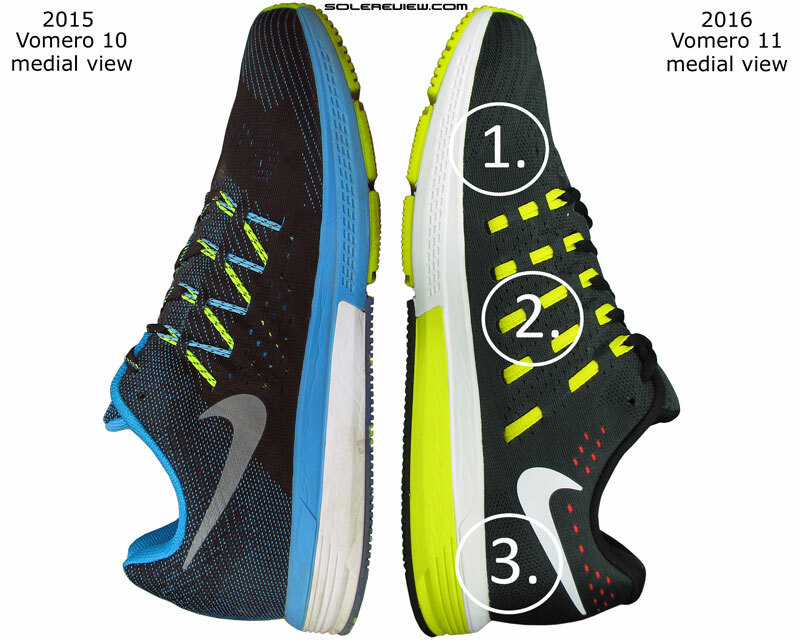 We’re willing to bet that the soon to be released Pegasus 33 is going to turn out softer than the 32. Considering the forefoot biased cushioning, the Vomero 11 is a great shoe for forefoot strikers who crave for a soft ride underneath. There aren’t many shoes which has this unique distribution of midsole cushioning. The general industry norm is a soft heel, with cushioning tapering downwards to a firmer forefoot. Let’s talk about a slightly different topic. 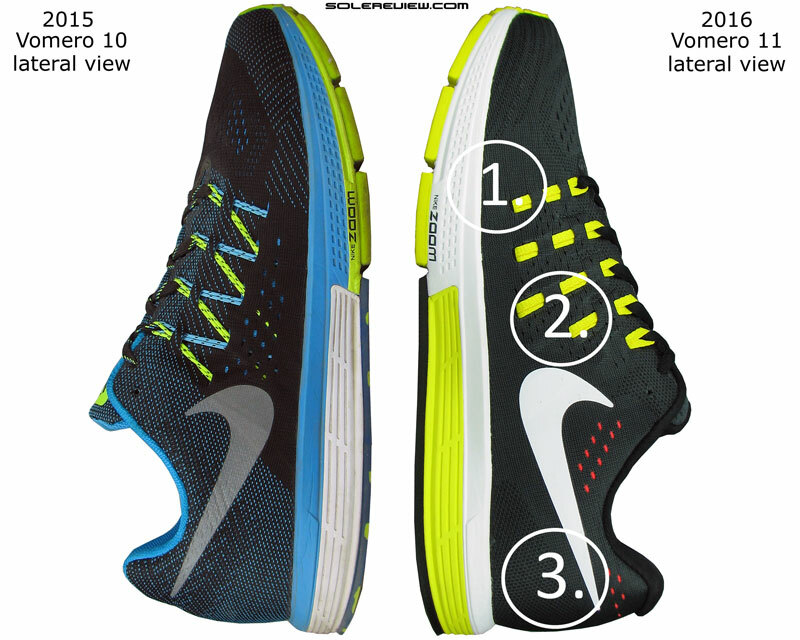 Is the Vomero 11 a ‘fast’ cushioned shoe, as Nike’s trailing-streaks-of-light marketing suggests? In our opinion, that description is a better fit for the Vomero 10 than it is for the 11. Multiple parts of the Vomero 11’s midsole have been given the soft treatment, and generally speaking, a firmer shoe feels faster than a soft one. Just by possessing a firmer midsole, the Vomero 10 felt much faster and efficient in the transition department than the 11. 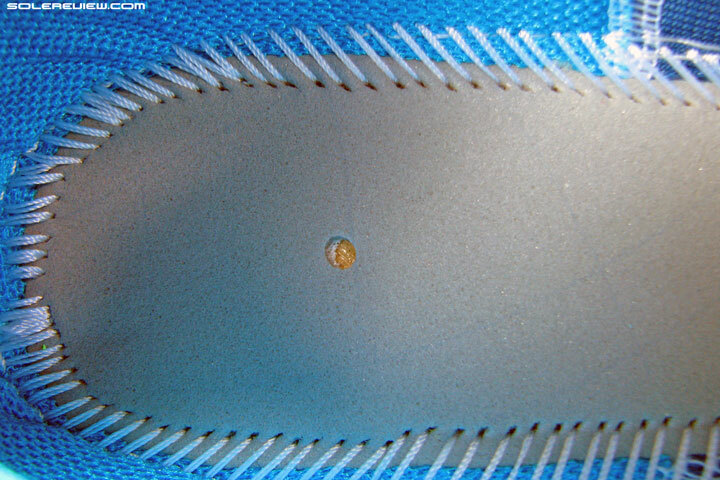 The full contact outsole is a regular fixture on most recent Nike running shoes. This design does produce smoother transitions. 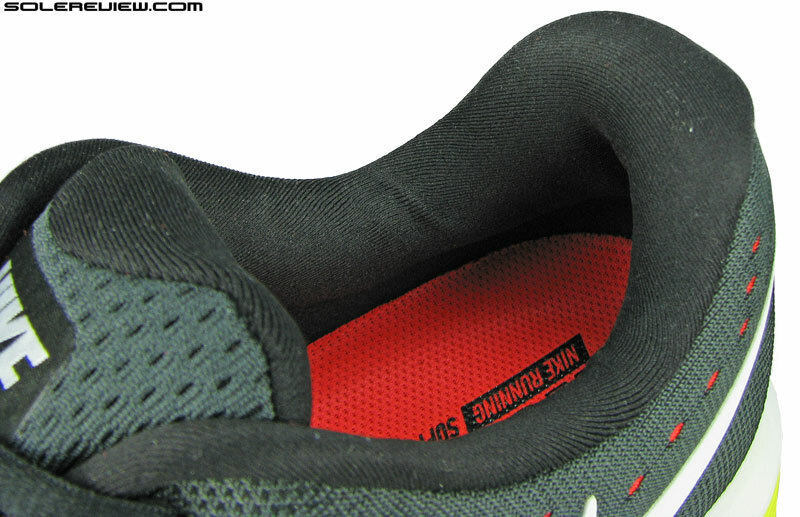 The outsole retains the ‘crash rail’ design, which is meant to help transitions. It still does, though with the softer ride quality the Vomero 11 doesn’t feel as agile in progressively transferring weight over its midsole. Not exactly sure why Nike suggests the Vomero to be fast shoe. It isn’t supposed to be one, and besides, you have multiple models such as the Zoom Elite, Lunartempo, Lunaracer and Streak to do that job. When it comes to a comfortable, responsive and cushioned ride, the Vomero 11 is right on the money, and that’s what it should be positioned as. 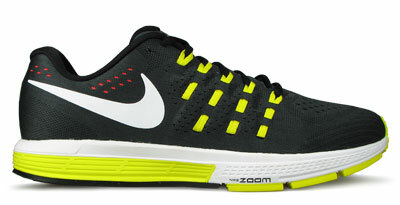 Why say things like fast, which is pretty meaningless if you’ve run in shoes such as the Zoom Streak or the Lunaracer. Does it feel any faster than shoes such as the New Balance 1080 V6 or the Saucony Triumph ISO 2? Not really. In fact, the aforementioned models feel more nimble than the Vomero 11. Both are similar looking shoes; so why is the Vomero 11 (right) nearly a full ounce heavier? And there’s one important thing about the Vomero 11 you should know. It is nearly a full ounce heavier than the outgoing version. Which in empirical terms is nearly a 10% weight gain over our tested color of Vomero 10. Which is odd, because the midsole design hasn’t really changed. There are still two Air bags, and a softer midsole usually translates into lower weight. We did mention that there were design updates on the upper, so perhaps those changes led to a weight increase? Let’s head there to look for answers. The upper template is straight off the Vomero 10. Single piece Flymesh, and the strap lacing support surrounds the midfoot region. The basic visual template is similar to that of the Vomero 10. 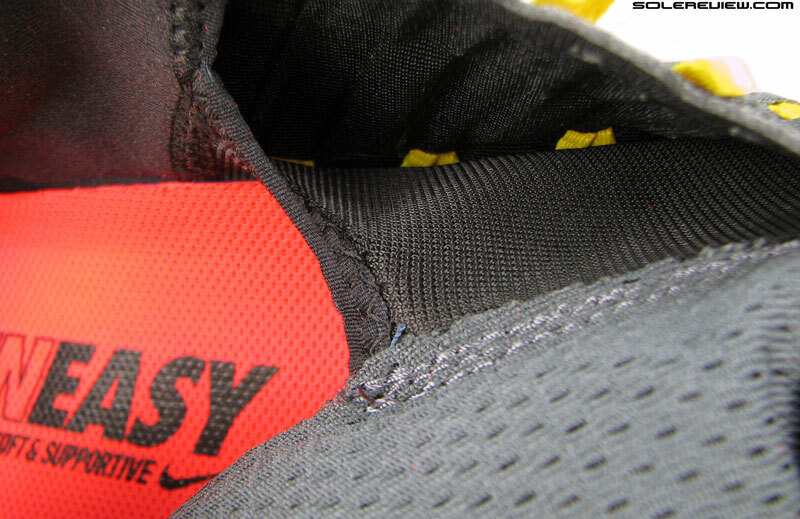 The side profile reveals the continued use of Nike’s ‘Flymesh’ material; a single piece mesh upper combining the use of vented and non-vented areas for breathability and support. 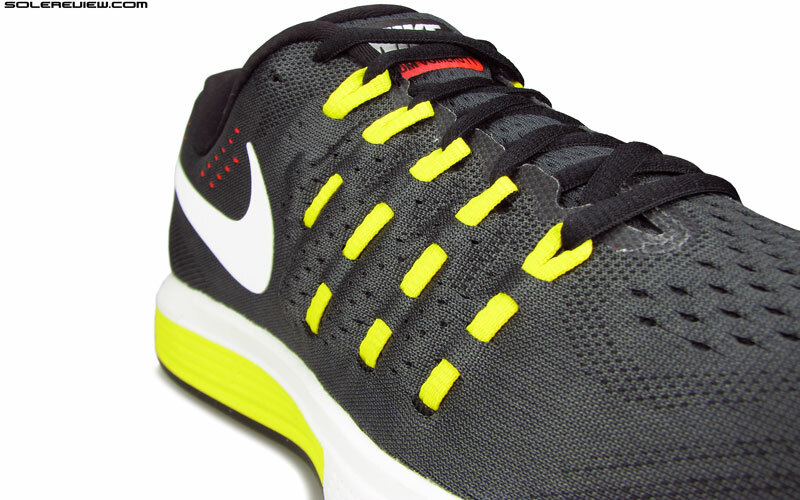 The lacing is hooked to the Flywire straps on the midfoot, and a Nike Swoosh logo stretches towards the heel. Most of the structural updates which affect the fit are neatly camouflaged within the aesthetic sameness. It is only when you put the Vomero 11 on is that fit alterations make themselves felt. The heel collar now has a lot of padding, unlike the sparsely filled heel of the Vomero 10. Take the heel part to begin with. One of the negatives highlighted on the Vomero 10 was its loose fitting heel, caused by the lack of foam padding inside. This year, Nike packs foam filling into the heel, and just like that, the heel grip goes from loose to super snug. The excess foam came with its own side effect, as we discovered soon after. There’s so much of heel padding on the 11 that the foot actually moves forward. With the heel considerably fattened, the foot is pushed forward towards the toe. We mean, look at the like-to-like comparison here. We drew a line where the foot was positioned inside the Vomero 11. On the Vomero 10, the thinner padding allowed the foot to sit closer to the heel edge. The V-11’s heel adds a lot of margin to that line, hence moving the foot placement over the shoe – towards the front. And we all know what happens as a result. The Vomero 11 fits slightly smaller than the 10, as the relocated foot eats into the otherwise available toe-box shape. And just how much smaller is the Vomero 11 versus the 10? To be on the safe side, we’d say that you go a half-size up. On a side note, the revised foot placement might also contribute to the increased heel cushioning. After all, the foot moves forward on the shoe, where the midsole thickness is greater than the thinner, tapered edge. The toe part has an internal stiffener as outlined. There are a few design updates, though. 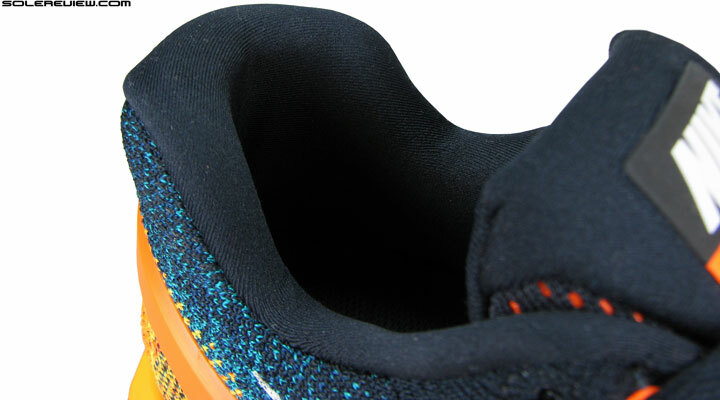 Besides the sizing, there are a few other updates concerning the forefoot fit. Both the Vomero 10 and 11 use an internal toe-bumper, a stiff component placed under the mesh to give shape to the toe-box. That said, the bumper used on the Vomero 11 is of a different design, and this affects the fit in a couple of ways. Inside the Vomero 10’s toe-box, the stiffener’s edges extended right up to the midfoot lacing area. It went over the big toe too, forming a canopy or ceiling of sorts. The Vomero 11’s stiffener is much shorter on either sides, around 20 mm or so. The shortened stiffener stops short of the small toe instead of going around it. This does not result in a noticeable fit difference around the medial/inner forefoot, but on the lateral/outer side, it relieves pressure over the small toe. The Vomero 10’s longer toe-bumper went around the small toe, as opposed to the V-11’s stiffener which stops short of the toe. That had the Vomero 10 fitting a bit snugger over the small toe. Though the overall forefoot is snug fitting, this minor change leads to a very localized fit effect – now only the Flymesh flanks the small toe, and not the stiffener. So that’s good. 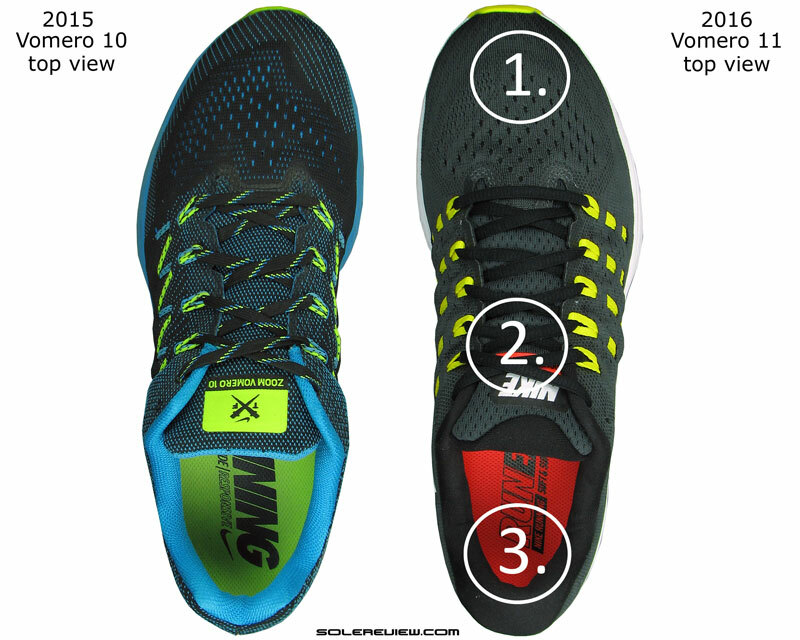 1) Shallower toe-box fit due to the heel pushing the foot forward 2) Thicker tongue eases off lacing pressure 3) Heel grip is assertive because of extra foam padding vs. the Vomero 10. The Vomero 11’s toe-box is more sloped around the big-toe than the Vomero 10 was, due to the how the new toe-stiffener is molded. That creates a shortage of space on the medial side of the big toe. And the toe-box is shallower than the V-10, because the foot is pushed forward towards the pointy end of the shoe. You want tongue padding, yes? The Vomero 11 (right) packs plenty of that. 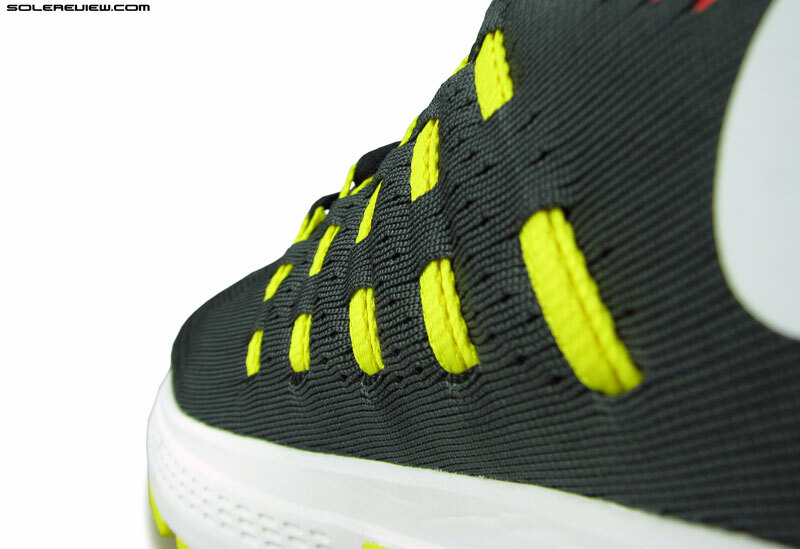 If you remember reading our Vomero 10, we had called out the thin tongue’s lack of insulation from the lacing pressure. With increased foam fill, the new Vomero 11 tongue does a far better job at filtering the pressure. It does play a part in making the midfoot fit super snug. And the tongue isn’t the only component changing the Vomero 11’s midfoot fit. The Flywire loops on the V-11 have changed from the twin cord design on the Vomero 10 to a flat strap kind. Not only that, the V-11 now uses five straps on either sides instead of four. This also means that the overall eyelet count has increased from six to seven, which means that the lacing rows are placed closer to each other than it was on the Vomero 10. Don’t let this picture deceive you – the tongue is attached to an inner sleeve. The Vomero 11 has an inner sleeve. The collar (heel) lining and padding stretches further inwards this year. An increased count of lacing rows produces a higher level of midfoot grip,and that’s clearly evident on the Vomero 11. The foot feels packed inside the midfoot upper, compared to the easygoing fit character of the Vomero 10. The inner sleeve stays on the 2016 Vomero 11, carried forward from the 2015 Vomero 10. The ‘Flywire’ side straps are now flat instead of tubular cords. Good – we never quite liked the earlier kind. Ever since the watered down, cord based Flywire made its appearance (substituting the original Vectran based Flywire), we’ve been vocal about its shortcomings. The chief of which was exerting side pressure; after all, tightly sprung cords have a tendency to do that. The closer placed, flat straps of the Vomero 11 performs well at distributing pressure evenly, without any of the dig experienced from tubular Flywire cords. Of late, we’ve seen Nike models switch to this flat strap design, and we hope that is the norm going forward. This is a step in the right direction, as the cord based Flywire wasn’t very comfortable to begin with. The Vomero 11’s midfoot panel is molded. This equalizes the side pressure. 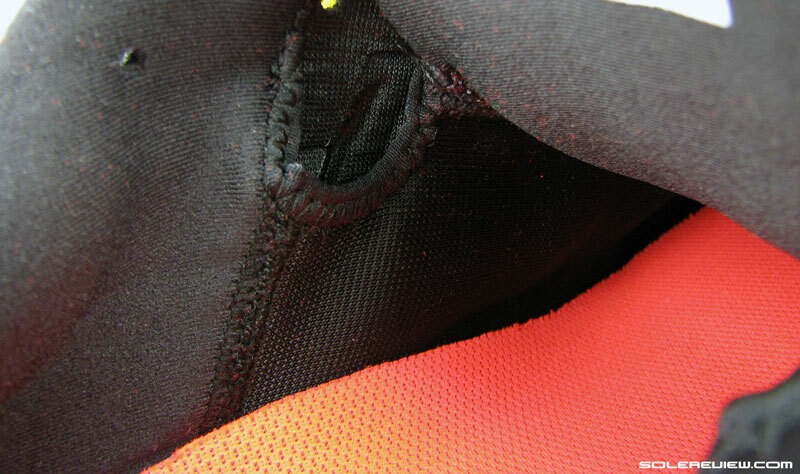 You can see the molding detail between the mesh upper and the sleeve. It also helps that the Vomero 11’s midfoot portion is molded; it makes the upper stiffer and takes the bite off Flywire. The molding produces a subtle visual impact on the outside. 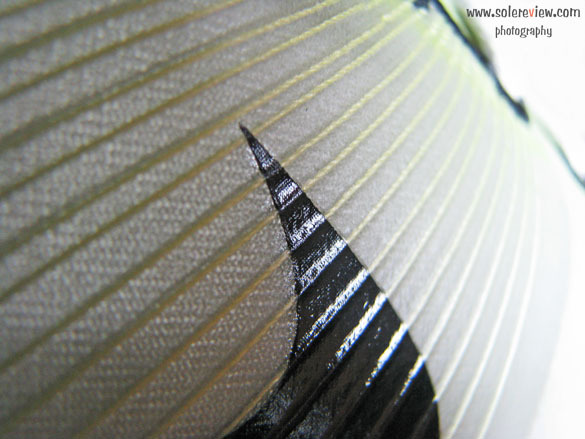 It is more noticeable on the reverse side of the mesh upper. That sums the Vomero 11’s fit up. Very snug overall, and fits nearly half size smaller than the Vomero 10. But is padded and snug the same thing as plush? 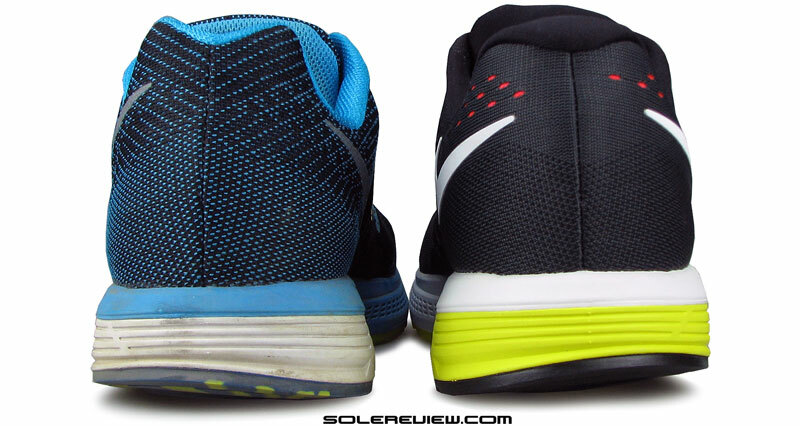 Nike should have used the same heel and tongue lining used on the V-10, instead of switching to a fabric which is straight out of the Lunarglide. The V-10 mesh had a soft hand feel, and would have teamed-up well with the foam padding. Asics demonstrates this technique well, with its models such as the Kayano and Nimbus combining soft lining with ample foam padding. And so does Brooks and Saucony. The Vomero 11 goes old school in logo design. It is a glued-on synthetic instead of the fused laminate used on the Vomero 10. So yes, the Vomero 11 loses some of its earlier upper plushness. We haven’t got around to answering the question of Vomero 11’s substantial weight gain yet. There’s more material used on the new upper for sure, but that doesn’t really explain a 23 gm/0.8 Oz increase in each half pair. That’s a lot, even if the side Swoosh logos have gone from the laminated kind to a slapped-on synthetic. And what’s our verdict on the Vomero 11? We love a few things about the latest model. With its soft and responsive ride, the Vomero 11 goes back to its original roots. 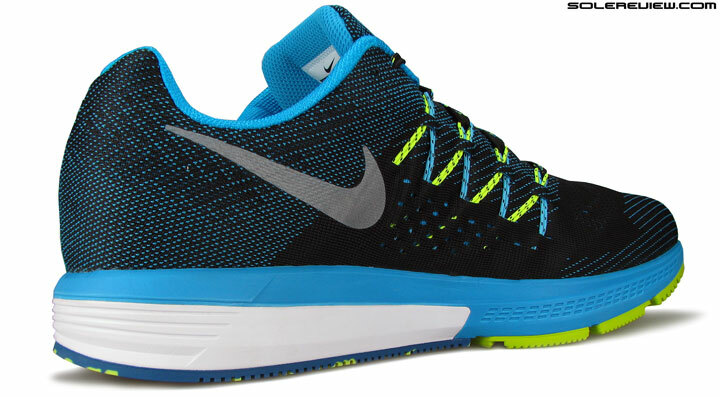 The transition is good for a shoe this cushioned, and it is relatively supportive too. The changed upper fit and the significant weight increase evokes mixed feelings. Runners ordering the smaller fitting Vomero 11 will be caught unawares, because both the V-10 and 11 look so similar. Also, the bulky Vomero 11 does not feel as nimble as the 10, though we’re not sure whether that is a good thing or bad. 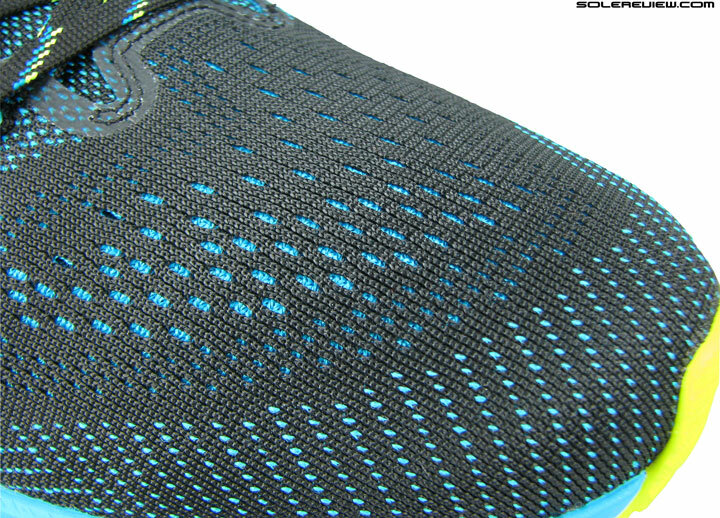 And we liked the two-tone effect of the Vomero 10 Flymesh, as opposed to the monochromatic 11. But that’s just a personal opinion. Looking to upgrade your 2015 Vomero 10 to the latest version, but not sure how the latest 2016 model compares? We can help here. The following info-graphic is a ready-reckoner for what changes you might expect in the new model vs. old. To make this more fun, we’ve put in a system of percentage match, which calculates a weighted average for a set of attributes.